Jac o' lyn Murphy: Thinking back on the "Elegant Kegger"
Thinking back on the "Elegant Kegger"
I am helping a friend with a few things for her husband birthday party tomorrow. Phil and my husband, Matt, have solved many of the world's problems over an ice cold beer. 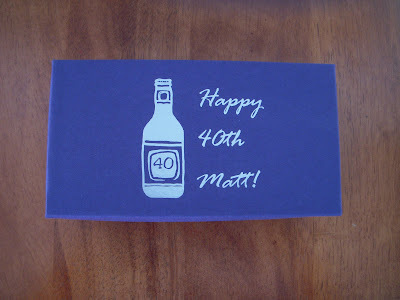 It is not surprising that they both had beer themed parties to celebrate turning 40. Matt went to culinary school and has been in the food industry for years. He loves fine food and wine but if you give him a beer and some peanuts he is just as happy. I wanted to throw an "elegant kegger" to show both sides of his personality. 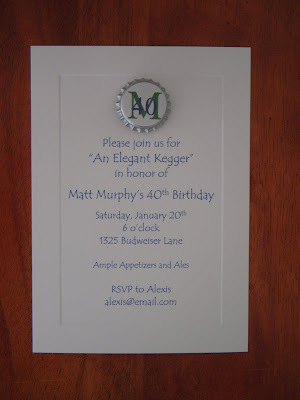 The invitations were on thick beveled cardstock with a special logo-ed beer cap mounted at the top. Great food, a keg and friends were the perfect way to celebrate. 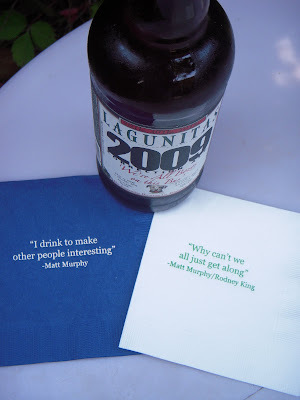 Matt is notorious for repeating the same cheesy quotes over and over...I took a few of them and put them on cocktail napkins. 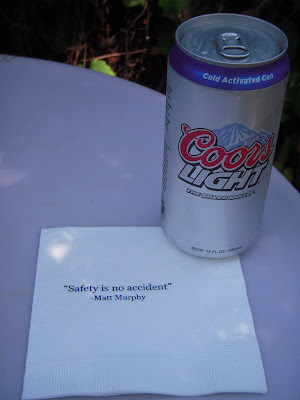 Some of the guests were upset that their favorite "Matt Murphy" quotes didn't make the cut! One of Matt's best friends, Eileen, owns a fabulous brownie company. Fairytale Brownies did these custom favors. What a treat.